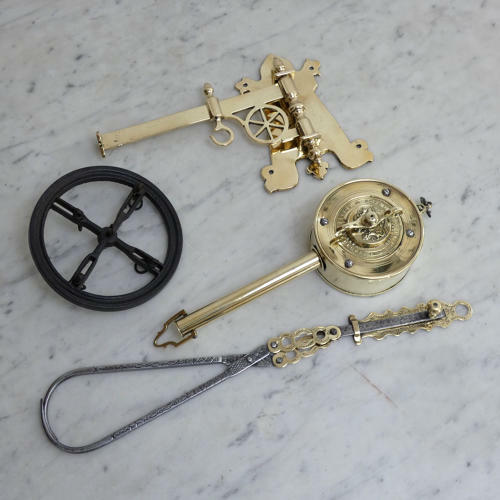 A fine quality Victorian brass spit and bracket, with an earlier steel and brass meat hook. We are selling this group of items as a set as they make such a fabulous display when hanging in a fireplace. Starting at the top, the bracket is a very attractive example dating from c.1860. It has a sliding hook so that the spit can be moved closer to, or away from, the fire. The spit is one of the less common types. It is circular, rather than cylindrical, and the face of the spit is marked, in the casting 'E.B. BENNETT & SONS SOLE MANUFACTURERS T. RESTELL'S PATENT WARRANTED'. All of this is around a raised, central section which is cast with a lion and unicorn and the latin phrase 'DIEU ET MON DROIT'. This is the Royal Coat of Arms for the monarch of the U.K. This also dates from c.1860. The steel and brass hook is a cantilevered hanger which grips a joint of meat, or bird securely, using its own weight. This is a fine example and it dates from c.1780. The brass is marked 'PATENTEE' and it is engraved with strange creatures and anchors. All three parts are in excellent condition and the spit appears to work most of the time. Overall the three pieces are 94cm. long and the bracket stand out from the wall 24.5cm.